While any container you can drink liquid out of can be called a cup, when it comes to feeding your pets, it is important to keep in mind that “a cup” is actually a defined unit of volume measurement. Now it does get a bit confusing, since the 8 ounces in “a cup” refers to ounces of volume, rather than ounces of weight. And that confusion can be further compounded by the fact that the volume in a fluid measuring cup isn’t exactly the same as that in a dry measuring cup. Fortunately though, those particulars aren’t really that important here (and I share a simple "work-around" below anyway). When it comes to your pet’s weight and their overall health, what is important is that an empty “Big Gulp” cup, an empty take out food container, and any other of the myriad empty "things" capable of holding food or water that people so frequently use to scoop their pet’s food are not the “cups” that we veterinarians and the feeding recommendations on the back of pet food bags are talking about. These measuring cups are. Why is this important? Because the pet obesity rate in the U.S. (and in many other countries, too) has truly ballooned to epidemic proportions. And while overfeeding a pet their regular food isn’t the only contributing factor, it certainly is a big one — and it’s one that’s easy to change. You can help your pet (and yourself) by getting a set of dry measuring cups specifically for your pet’s food, they’re inexpensive and easy to find. Or you can make feeding even more precise, without spending much more money, by getting a small kitchen scale to weigh the amount of food you’re feeding your pets (recommendations based on grams are also frequently given on the back of pet food bags). 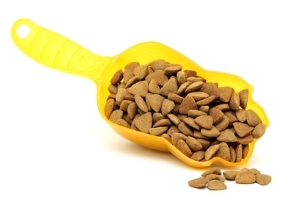 There are fine lines on the inside of most pet food scoops which indicate where the 1-cup and 2-cup volumes are. If your scoop doesn't have these lines, stop using it and start using proper measuring cups. If your scoop has the measurement indicators, make sure you measure accurately up to that line and not over it. 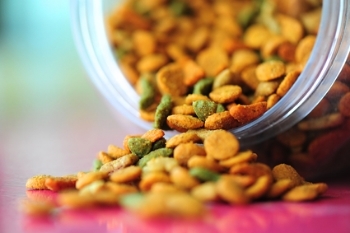 If you scoop too liberally, that "slight bit" of food over the line, especially in a cat or small dog, can quickly and subtly pack on the pounds. If your pet is small (under 25 lbs) it's best to use proper measuring cups or a kitchen scale. Do you give your cats or dogs any treats? Consider breaking those treats in half (or quarters). Or switch to low calorie or "training" treats. Pets care most about getting the treat and positive feedback from you, they don’t necessarily care how big the treat is. Replace some (or all) of their higher calorie treats with pieces of carrot, green beans, or apple (no apple seeds, though). Or make your own dehydrated chicken, beef, or liver treats. Take your dog for more frequent or longer walks. Get your cat moving by playing with a laser pointer or another interactive toy (just exercise caution when using strings or any other string-like objects). Talk to your veterinarian to see if there might be an underlying medical problem that could be contributing to your pet’s excessive weight (such as a low-functioning thyroid, over-active adrenal gland, a build up of fluid, or one of any other number of possible underlying conditions). If not, talk to them about a safe and effective weight reduction plan. And should you have to get weight off your cat or dog, please note that weight loss in pets should be slow and steady to be safe and effective. Typically cats and dogs should lose no more than 1-2% of their body weight each week. For more information and tips on pet obesity and weight management, see these cat and dog articles.